Just like the song says, I can’t bake a pie. You have to love Ethel Merman in Annie Get Your Gun, singing her heart out. 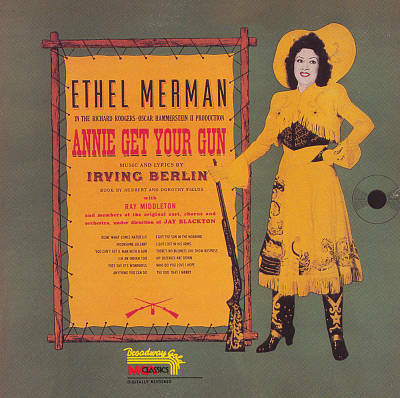 The competition between sharpshooter Annie Oakley (Merman) and marksman Frank Butler (Howard Keel) rolls out in the song, Anything you can do I can do better. Each claims to better the other. “I can knit a sweater,” says Butler. “I can fill it better,” says Oakley. But when it comes to pie? “Neither can I,” Annie admits. Annie and Frank married and joined Buffalo Bill’s Wild West show where she became chums with Sitting Bull (Tatonka Iyotake) and was given the Sioux name Watanya Cicilla (Little Sure Shot). A modern-day British sociologist named Ann Oakley has gotten mixed up with Annie Oakley in popular discourse, and you will find quotations from the sociologist attributed to the 19th century performer. “If love means that one person absorbs the other, then no real relationship exists any more. Love evaporates; there is nothing left to love. The integrity of self is gone,” says the contemporary Oakley. This entry was posted in american indian, authenticity, framing, Indian, Native Science and tagged American Indian, annie oakley, ethel merman, Indigenous Science, native american heritage month, sitting bull. Bookmark the permalink.